My earliest memory of getting a really bad fright was from the loudest possible blast emanating from the Philips tube radio that I had naughtily switched on; I did not realize that the volume was on full throttle. I remember running out of my mother's room on to the verandah, out of sight and out of hearing distance of that heinous sound. It was on that radio I remember listening to Radio Nepal songs. The songs in those days were nationalistic as defined by King Mahendra's ouster of an elected government and banning of political parties. The songs all had one theme: king, country and Nepali-pan in roughly that order. I did not understand the politics behind it but I liked the tune and lyrics of Dharma Raj Thapa, Nati Kaji and Manik Ratna. Radio Ceylon's "Binaca Geet Mala" hosted by the legendary Amin Sahni brought us a constant stream of the hit Hindi film music. There was the HMV phonograph handed down from an earlier period in which I listened to the numerous 45 rpm records in my father's extensive collection. Nimbu Didi my caretaker cranked the machine with zeal as she knew a thing or two about music having been brought up since childhood in a household of a royal collateral in Birgunj where her mother was the talime, the trainer of music and dances. 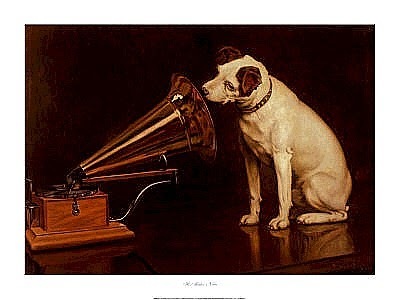 His Master's Voice with the iconic white dog with tilted head listening to a phonograph defined music for me. Didi sang together bhajan devotionals, love songs, and patriotic songs with equal fervor, many times playing her harmonium. Only my voice would not lilt and she hid her disappointment well. Technology changed and I remember in the early sixties a Panasonic turntable was gifted by Prince Basundhara to my father. The 33 rpm long-playing records were in vogue already and the sound was crystal clear and stereophonic, the sound coming from two different detachable speakers. We had a collection of English and Hindi songs. The Sound of Music and South Pacific defined the English film musicals. Dosti, Do Badan, and Sangam were the favorite Hindi film albums. I remember this player later went to school with me and during holidays our Jesuit priests permitted me to play music for the whole class to enjoy, a first I think in the annals of boarding school laxity. This turntable also accompanied us during the professional hunting trips organized by my father in the Terai and the evening bonfires permeated with the sound of music. In the sixties there were two school friends who enjoyed music with equal fervor, Pitamber Rana and Dipak Bir Singh. I remember going to Dipak's house at Keltole in Asan, a skyscraper by yesteryear's standard and after walking many flights of steps we presently came to his father's room where we listened to music under supervision. Going to Pitamber's was different as there was less formality and many times I was with another friend Govind. Music defined camaraderie - Dylan, Beatles, Santana, Rolling Stones - and thank God we did not get into hashish or even more lethal stuff. We grew up during the hippie generation of Kathmandu: lost souls in search of drug induced Nirvana. That was the time we had portable cassette players and we could copy and distribute music. From eclectic sources I replenished my collection constantly: Jimmy Hendrix, Janis Joplin, Creedence Clearwater Revival. In those days the prized music cassettes came with the hippies overland from Europe via Teheran and Kabul with tour companies such as Exodus and Encounter Overland. Music too defined our existence in the Brezhnev-era Moscow where I had gone to study. International students had an assortment of equipment to play the imported music and many played them very loud, the decibel competing one against another blasting the latest arrivals from the west. In staid Moscow where state run radio and TV stuck to classical music such as Tchaikovsky and Khachaturian, a collection of McCartney, Boney M and ABBA made instant friends and lousy mornings. In the spirit of things I acquired a quadro-phonic Toshiba and blasted my hostel floor to the joy of many and, I am sure, to the chagrin of a few. My roommates were encouraging. To Clifton from Guyana it was Jimmy Cliff and Reggae, to Paulo from Brazil schooled in Phoenix, Arizona it was Elvis. Why this reminiscence one might ask? Well, I am toying with the iPod Touch I have acquired and I am syncing music from the iTune software in my laptop for my daughter who arrives here for her Christmas holidays. The iPod plays loud music brilliantly from a Logitech dock with concert quality sound. What a far cry from the simpler days of my childhood when Didi cranked the HMV and I changed the stylus to play the 45 rpm records and it was still equal music to my ears! "King, Country and Nepali-pan" have been cited as the themes of King Mahendra's songs. How wonderful it would be to now have songs with the same themes - but in the reverse order! Nationalism was then equated with the monarchy. We are older and wiser now. If the monarchy can bolster nationalism, it has a place in Nepal. But the Nepali People must be allowed to decide, not a coterie of power-crazed brain-dead politicians.